A fast-paced hard SF novel from the author of Manhattan Transfer. A man journeys home to the underground colony of Neverend, where passions are rekindled . . . and where an ancient mystery waits to bring salvation–or destruction–to all who encounter it. Lan has returned to Neverend for a high school reunion. He wants to rekindle his relationship with his previous girlfriend, Tessa except his claustrophobia keeps him from being comfortable in the underground caverns. While there, he learns that someone is trying to buy/steal the museum Tessa’s father left to her. Lan calls in help to figure out what is going on and they discover that there is a lot more to the museum than originally thought. This was an interesting read. It’s a good story with enough action to keep you interested without too much science and technology to bore you. I liked the mystery of what was going on and why were they trying to get the museum. I thought the ending was very fitting and wrapped everything up nicely. This is a great scifi read. It’s one to definitely check out if you like the classic scifi stories. 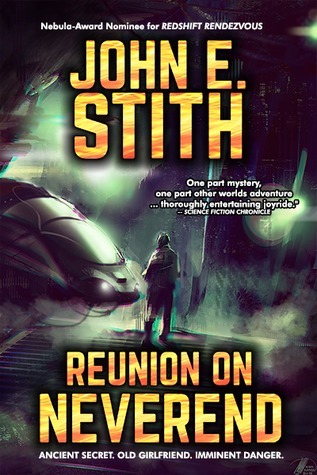 To purchase Reunion on Neverend make sure to check out Amazon, Barnes and Noble, Goodreads and John Stith’s website. I received Reunion on Neverend for free from Sami at Roger Charlie in exchange for an honest review.